Every boiler in the Worcester range is A-rated for efficiency, meaning it turns over 90% of the fuel it uses into heat. Compare that to older boilers, which can be as little as 50% efficient. That means 50% of the fuel you pay for literally goes up the chimney. Many modern boilers are still only 70-75% efficient - so it is important to carefully consider which boiler you have installed to guarantee money-saving efficiency. 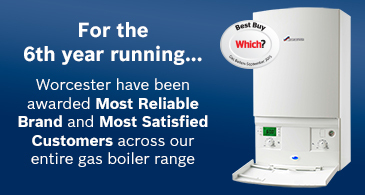 For further peace of mind, every Worcester Greenstar gas and LPG boiler has been awarded a Which? Best Buy accreditation. Worcester Bosch has a wide range of boiler types on the market so you can be sure to find one to suit your home and lifestyle. Each boiler has its own installation requirements, so talking to an expert is important. We will look at things like the size of your property, mains water pressure, the number of bathrooms or showers,if you have a loft and whether you want to free up space. We will also consider how you use your heating and hot water and if this might change, such as if your family is growing. Gaining expertise from the right company, such as Cliftons of Wrexham will help to make this process simple, whilst also ensuring you receive a boiler that meets all your needs, both now and in the future.